Haneke’s latest film follows three generations of a bourgeois family living in Calais, who are self-absorbed and in many respects alienated from each other and the world in general. The young spend their time looking at their computer screens (and those of their parents), the middle-aged search myopically for sexual and financial satisfaction, and the old look for an easy death. 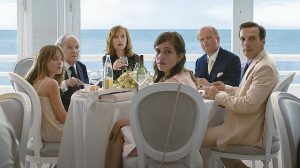 Haneke uses phone screens, security screens and soundless sequences to highlight this alienation, along with moments of dark humour, delivered by a formidable ensemble cast.